As I have been studying about cultures within organizations there are a few points that I would like to elaborate on. We are learning that the best way to assess a culture is with a group of parties that are part of the culture. The key idea here is to NOT take on a traditional role of a consultant or coach with the attitude of changing a culture BUT to rather understand how that culture operates. In a well organized evaluation of a culture, the key concept is to learn what some of the operational issues might be, and where perceived concerns may exist. It is very important prior to performing a cultural review of an organization or business to have a basic understanding of what some of the challenges may be. The key idea and the emphasis is not on changing the culture as much as it is to understand what the prevailing mindsets and assumptions are that may prevent optimal operational efficiency. When evaluating a culture we may discover that there are certain subcultures within the main culture that may retard growth. A normal role that will bring value and benefit to the organization or business is real time alignment of those subcultures to the main culture driving the organization. Clarity and focus is a normal part of this kind of work. The leaders are generally the shapers and molders of the culture, and they engage to help during this process. Identifying and empowering those key leaders is helpful in advance in effort to have successful cultural assessment and change process. Learning what those leaders believe and what their operational assumptions are is helpful to bring about desired end results and assure executive leadership receives the help needed to have a competitive edge. In order to truly maximize a culture it requires skill, time and commitment of the executive leaders all through the entire rank-and-file of the organization. It stands to reason that there are varieties of cultures in every organization. It is a mistake to try to categorically place an entity in a certain quadrant or try to box them in to one that the consultant may have had an earlier experience with. The point here is that each project is custom and requires incredible focus to ensure optimal reporting to the client. Failed cultural alignments happen when inexperienced practitioners attempt to qualify the culture or use bad assessment tools. Having an understanding of when to do what, and when to allow the client to engage is key to long term impact. Often during the evaluation process we discover areas that when identified, understood and changed have an impact to the bottom line. The impact may not be financially beneficial at first because we often expose gaps that may require resources to close. The idea of retaining a professional to facilitate a cultural improvement process is fundamentally valuable to those that work within that culture and greatly beneficial to the constituents or clients served by the entity. It stands to reason that the personality of the organization or culture is their character. 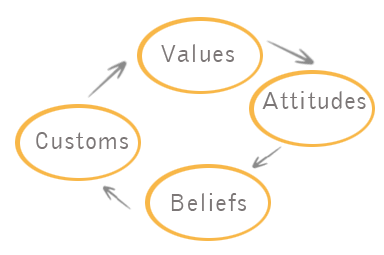 The sum total of the Attitudes, beliefs and commitments have much to do with the culture and the alignment. The following excerpt from the book “The Corporate Culture Survival Guide” by Edgar H. Schein provides some mindsets needed as a resource to understand and implement a change process that includes a cultural assessment. • Culture can be assessed by means of individual and group interview processes, with group interviews being by far the better method in terms of both validity and efficiency. Such assessments can be usefully made in as little as half a day. • Culture cannot be assessed by means of surveys or questionnaires because one does not know what to ask, cannot judge the reliability and validity of the responses, and may not want to influence the organization in unknown ways through the survey itself. • Survey responses can be viewed as cultural artifacts and as reflections of the organization’s climate, but they are not a reliable indicator of the deeper shared tacit assumptions that are operating. • A culture assessment is of little value unless it is tied to some organizational problem or issue. In other words, diagnosing a culture for its own sake is not only too vast a problem but also may be viewed as boring and useless. On the other hand, if the organization has a purpose, a new strategy, or a problem to be solved, then to determine how the culture impacts the issue is not only useful but in most cases necessary. • Any issue should be related to the organization’s effectiveness and stated as concretely as possible. “The culture” as a whole is rarely an issue or problem, but cultural elements can either aid or hinder the solution to the problem. • The assessment process should first identify cultural assumptions and then assess them in terms of whether they are strengths or constraints on what the organization is trying to do. In most organizational change efforts, it is much easier to draw on the strengths of the culture than changing the culture. • In any cultural assessment process, one should be sensitive to the presence of subcultures and prepared to do separate assessments of them to determine their relevance to what the organization is trying to do. ← Key ingredient to developing a healthy culture.